I just posted this (initial) review of a brand new tripod to a Facebook group of about 2500 architectural photographers. How long have I owned this tripod? About 2 hours. Okay, here’s the verbatim review that I spewed out moments ago. I just received a tripod that I backed on Kickstarter, and wanted to share my excitement with people who might be interested (my wife nearly fell asleep during the unboxing). And since I'm so terribly excited about a new toy, I'll mention that I'm not being paid to pimp this thing (nor does the company know I'm volunteering myself as their company evangelist). I just want them to succeed because the other product of theirs that I own, the Breakthrough ND X4 filter, is a wonder to behold. Part of the reason I'm excited about the new tripod is because it is a local company. Part of the reason is because I'm one of the first people to get the new tripod so I feel like one of those exclusive reviewers you read about in YouTube Weekly. And the other part is because it's actually very well made. Their main product is a ball head which means absolutely nothing to me because I already have a ball head for travel and a geared head for work. But if you scroll waaaay down, they've also designed a carbon fiber tripod. They claim it's more rigid and stable than a $700 Gitzo. I take that claim with a grain of salt because I don't have any real world experience with high end carbon fiber tripods. But I do know for a fact that its worlds apart from my Manfrotto 055 in build quality. Before I get too fanboy about it, I'll just state my initial pros/cons. Pros: tight tolerances, build quality, light weight, collapsible to 20 1/2". Con (only 1 right now): wish it could go higher. This one, their only model so far, extends to 62 inches. If they end up making another model that goes another foot, that'll be my go-to tripod for everything. So what does this all mean to the average visitor to my website? It means photographers love new things that make our lives easier. If this tripod lives up to my initial assessment, it means my back will ache less from carrying a tripod that weighs 3 1/2 lbs vs 5 1/2. It means more stable shots, which is a life saver during long twilight exposures. It means being able to fit a high quality tripod in my carry-on luggage. But maybe most importantly, it means having a physical symbol of how far I’ve come as a photographer since I first started my business. Or maybe more accurately, it’s a present to myself for sticking with something and learning as much as I can about it so I can discover just how far it’ll take me. I've been talking with several new clients lately, and one thing I tend to stress with those who haven't worked with a professional photographer before is the importance of the scouting shoot. What is a scouting shoot exactly, and why is it beneficial? The process is simple. My client and I show up to the site and have a look around. I'll bring my camera and a zoom lens (no tripod, no lights) and start shooting different angles that I think would work well, and that the client thinks would work well. 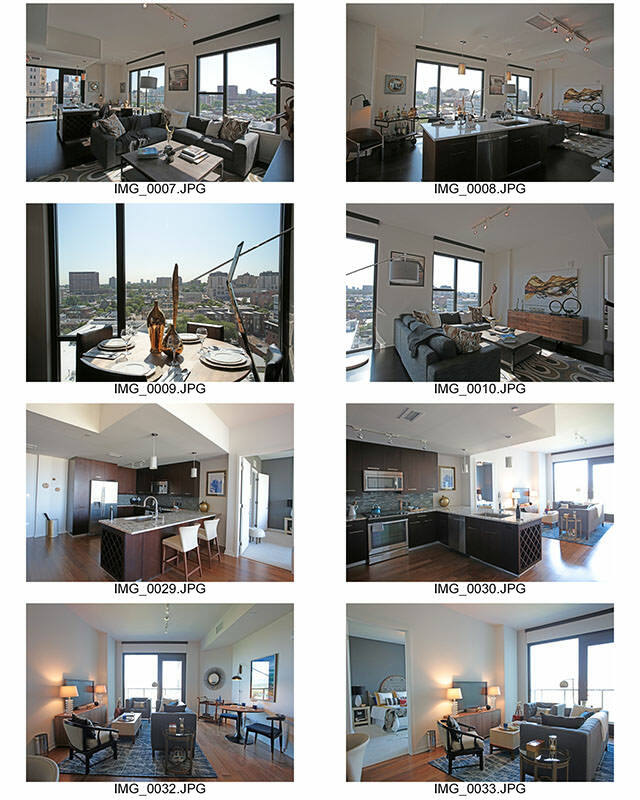 If my client has very specific angles in mind, I'm happy to photograph those and include them in the proof sheet. But I'll also pick out compositions that I like, because oftentimes what looks great in person doesn't quite translate to the 2D photograph. In addition to finding the best compositions, I'll be checking out the ambient light situation for each space. At what time of day does the natural light look best in this kitchen? Are we shooting any spaces that have no sunlight and therefore can be photographed whenever we're done shooting the more critical spaces? How many studio lights (if any) will I need for the shot? Finally, I use the scouting shoot to figure out staging & styling needs for each composition. Maybe a couch needs to move back a couple feet to open up the visual space. Maybe that kitchen counter could use a few lemons & limes for a pop of color. It's all about planning ahead! After the scouting shoot, I'll put the images on a proof sheet and send them over to the client. We'll usually discuss them over the phone with the pros & cons of each, then narrow them down to a set shot list. This gives the client a definitive list so we can have a firm plan of action on the day of the shoot, use our time as efficiently as possible, and be on the same page creatively and stylistically. If I were only interested in making a quick buck, I'd actually advise AGAINST a scouting shoot. After all, you'll spend more time at the shoot ($$$), end up making more images than the client really wants due to trial & error ($$$), and spend more time in post production because you didn't plan ahead ($$$). But I'm interested in making the best finished image possible, and to do that requires planning and preparedness. That means knowing ahead of time what tools I need to bring to the shoot (lenses, lighting, grip, staging items), how I'll want furniture & accessories arranged, what time of day I want to photograph the space, all in order bring a vision to fruition. NOW... with all that said, sometimes a scouting trip just isn't possible for various reasons. In that case, I still like to be as prepared as humanly possible. That means requesting any cell phone pictures that the client can send me (the more the merrier), getting the address so I can Street View it online and find out what position the sun will be at any given time of day, and asking my client what angles they'd like to use. However, the real life scene was a bit messier, as you can see in the following closeup. Cords, routers, phone jacks, and cover plates galore! What a disaster under that desk. Normally to clean up errant cords and other atrocities, I'll use the Heal tool and grab samples from nearby areas that are free from clutter. However, in this case it was one big jumbled mess so I had to dig deeper. I started by making three separate selections and saving the selections individually to use later as needed: 1) wall under the desk; 2) floor under the desk; 3) trim under the desk. 1) I repainted the wall with the Brush tool, trying to emulate the existing shadows more or less as I went. Next, I added a bit of texture to that layer to simulate the existing wall texture. 2) Next came the carpeting which just needed minor touchups via Heal tool. 3) Finally, much of the baseboard trim had to be reconstructed from scratch so I repainted over the cords with white, then drew in the contour lines to match the original. In all, the cleanup took maybe 30 minutes and was well worth the effort to remove the hideous ball of snakes in an otherwise clean and tidy room. Thanks for reading! After years of trudging through code to build and maintain my own site, I've decided to go the easier route and join Squarespace. Although I can't get quite as customized here as I could in the wild west of hand-churned CSS and HTML, I find this format much easier for adding and updating content. © Morris Photography. All Rights Reserved.